It's not quite Star Trek communications -- yet. But long-distance communications in space may be easier now that researchers at the National Institute of Standards and Technology (NIST) and Jet Propulsion Laboratory (JPL) have designed a clever detector array that can extract more information than usual from single particles of light. Described in a new paper, the NIST/JPL array-on-a-chip easily identifies the position of the exact detector in a multi-detector system that absorbs an incoming infrared light particle, or photon. That's the norm for digital photography cameras, of course, but a significant improvement in these astonishingly sensitive detectors that can register a single photon. The new device also records the signal timing, as these particular single-photon detectors have always done. The same NIST/JPL collaboration recently produced detector arrays for the first demonstration of two-way laser communications outside Earth's orbit using the timing version of pulse position modulation. The new NIST/JPL paper shows how to make an even larger array of detectors for future communications systems. The new technology uses superconducting nanowire single-photon detectors. The current design can count tens of millions of photons per second but the researchers say it could be scaled up to a system capable of counting of nearly a billion photons per second with low dark (false) counts. 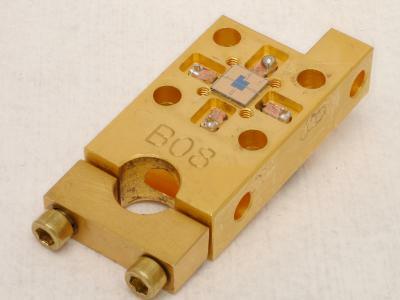 The key innovation enabling the latest device was NIST's 2011 introduction of a new detector material, tungsten-silicide, which boosted efficiency, the ability to generate an electrical signal for each arriving photon. Detector efficiency now exceeds 90 percent. Other materials are less efficient and would be more difficult to incorporate into complex circuits.